Google Maps Frustration - Can this be done? If not, what's an alternative? 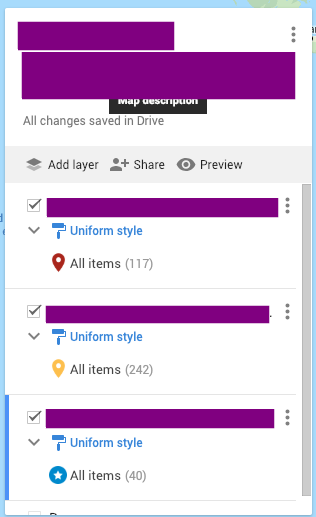 A client of mine wants some specific things with an embedded Google map. Currently, embedded on their page is a Google Map that shows their 300+ distributor stores around the country. Each has its own pin that shows the business name, address details and contact number. They have 3 different types of distributor: Preferred, Midteir, and people who have an account with my client, but not a huge range (low tier). Each pin for the different types is a different colour and they preferred to have a star symbol instead of a pin. Now here is where the client is picky. In google maps, we want the star-pins of the preferred distributor to show up ontop of the other distributor pins if there is any overlap. This is automatically done if you arrange the different distributor types. By putting that blue one at the bottom, it puts the blue pins as the top layer on the map. However, the client has noticed when he goes into the Maps and searches for a location to find a local distributor, the listed results show the red ones first (low tier distributors), and the blue ones last (priority distributors). Obviously, we would like the preferred suppliers (blue) listed first in the search results and the red last, while still having the blue pins show on the top layer. Does anyone know how I can do this with Google Maps? If not, can anyone recommend an alternative map software that I can use and embed on the site? Good luck man. I hope you find a solution. I want to stab my eyes out just thinking about this. Clients are the worst. Haha, don't get me started on this one - micromanagement, focus on irrelevant details, the list goes on. My contract with him finishes at end of March. I'm not renewing. This seems like a problem with Google Maps itself, where they have the priorities of the locations inversed depending on which view you're looking at. The lowest priority "ranks" the highest in the text list but ranks lowest on the map's z-index. I'd raise the issue on Google's support forums. I bet they'll at least agree it needs to be fixed, which would get you off the hook with your client. They'd have to choose which is more important to them and you can pass the blame to Google.